Supplements your boat's existing anodes. An excellent anodic device to supplement a vessel’s existing anode system, especially to counteract stray current from defective shore power. Choice Zinc, Magnesium or Aluminum. With Martyr™ anodes by CMP, you can choose between traditional Zinc, aluminum or magnesium alloys. Aluminum and magnesium alloy anodes by CMP do not contain cadmium-which is a substance of enviormental concern. CMP is the only company that has the capability to produce cadmium-free anodes that perform in all three boating water types. Martyr™ anodes meet all US Military specifications for zinc, magnesium and aluminum alloys. Testing in an in-house facility ensures strict adherence to quality standards. Zinc anodes are intended for use in highly corrosive saltwater, replacing deteriorated original anodes. Used in saltwater, aluminum anodes protect better and last longer than zinc. Used in brackish water, aluminum anodes are superior to zinc which can "passivate" and not work at all or magnesium anodes which corrode too rapidly. Aluminum anodes are also lighter than zinc and contain no cadmium which is a substance of environmental concern. 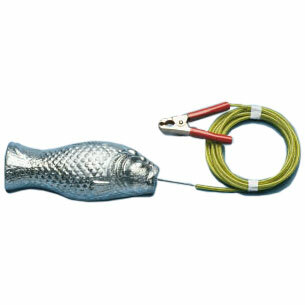 Use Cadmium-free, magnesium anodes if you only use your boat in freshwater. (Zinc anodes can "passivate" and stop working in freshwater.) Magnesium anodes should not be used in any other water type. If you trailer your boat, and use it in a variety of saltwater, brackish and freshwater locations, aluminum anodes are the best all-around choice for protecting your outboard or outdrive. What kind of zincs does your boat need?